The Emporium was the only store in Coalmont for many years but closed in 1988. 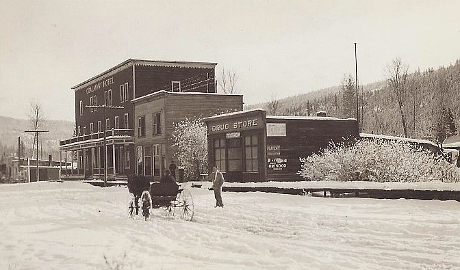 It was built by Walt Smart and he moved from his previous location across the street in what is now called the Coalmont General Store. The hope was to add a second story later. That never came to be, and now it is all gone. 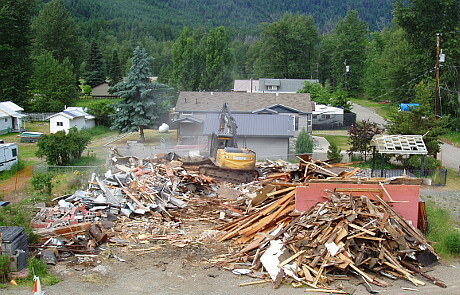 On Monday, June 26 Bob Reichert arrived with his big excavator and demolition began. The building had become quite derelict and there was not much to save except the memories. The new owners of the property plan to landscape the lot. One thing is for sure, the old familiar view when you enter Coalmont is very different and will take a little while to get used to. It doesn’t take long before most of it is ready to haul away. The view at the entrance to town is very different now. Here is what the building looked like on July 19, 2015. Granite Creek Cemetery has once again been attacked by irreverent treasure seekers. Over the weekend there were more than sixteen holes dug by someone – presumably in search of interesting historical items. The desecration took place in the Chinese section, so it seems the impostors had some idea in mind relating to that culture, at least as it was in the early days of gold mining in this area. 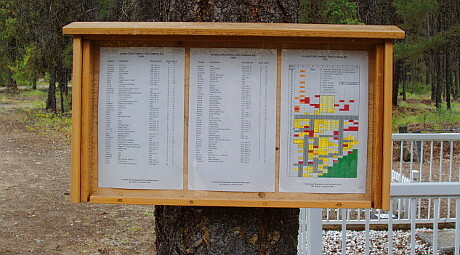 There is a sign at the historic graveyard with a map showing the layout of the plots. The Granite Creek Cemetery is one of the few places where there is a memory of the many Chinese miners who came here and died here. They were not shown much respect in their day, and it behooves us to remember them now as they contributed much more to the life of the day and history of this Province than is generally written about. Other important pioneers of the area, such as Foxcrowle Cook, are also buried here. 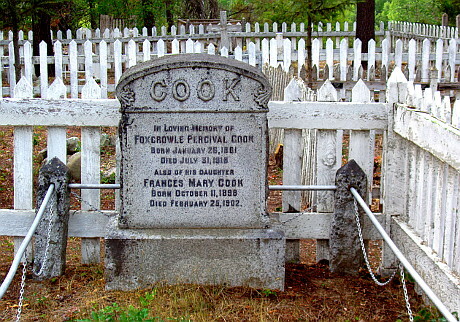 What some visitors may not know is that this little country graveyard is still in current use by local families, many of whom trace their roots back to those exciting days of the 1880s when Granite Creek attracted hard working pioneers who laid the foundation of what we have here today. A reader has requested that we post pictures of the actual holes dug. Here are four examples. 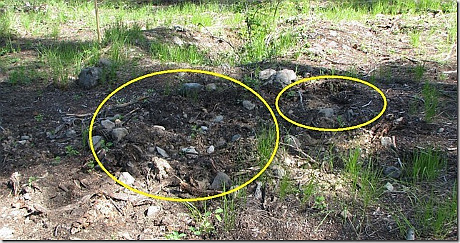 There is an exhumed Chinese grave in each photo, so you can judge the proximity and size of the holes that were dug over the May Long Weekend. This is less than half of them. 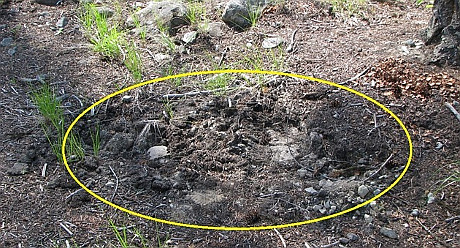 Some of them overlap, leaving an area about 2 metres across disturbed. This is actually a delicate archaeological situation and requires more than usual sensitivity on the part of visitors. 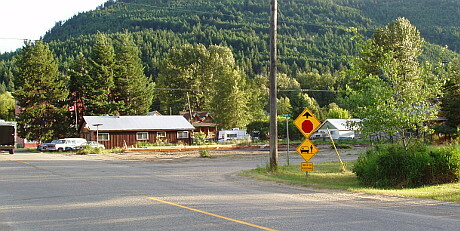 Maryanne was born in Prince Rupert BC, and raised in and around Stewart BC, where she met and married her husband, William (Bill) Woodford, in 1969. They moved around BC for several years, lived in the Yukon for 10 years, relocated to Princeton area in 1983, finally to Coalmont in 1985. Maryanne is remembered by the dedicated and tireless volunteer work throughout the communities of Coalmont, Princeton and Tulameen. 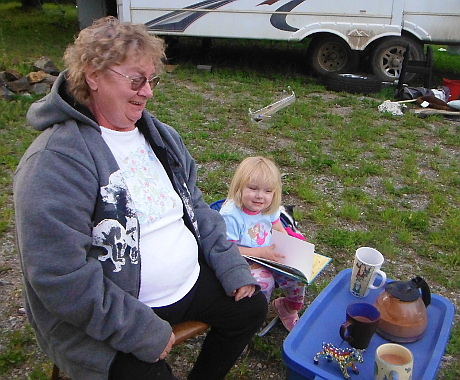 Most notably are the countless years she dedicated herself to the Fall Fair. 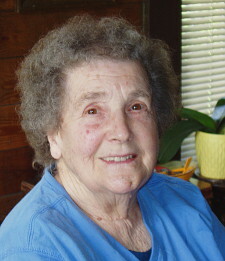 She loved her pets, gardening, crafts such as knitting and crocheting and being creative with the magic tree. She also had a passion for cooking and would teach her skills to anyone who was around. Fresh bread and canning was always being prepared though out the year and there was always a hot meal on the table with more than enough to go around. Maryanne leaves memories with her family: Daughters – Jody and Sherry, Son – Garnet, Grand Children – Drew and Elyssa, Brothers – David and Richard, Sisters – Heather and Virginia, and several nephew and nieces. Not to mention everyone who had had the pleasure of knowing her. One of her most remarkable characteristics would be for Maryanne’s determination and attitude towards life events; she never would let the hard times diminish her spirit and always would have a smile on her face and have a kind word about and to everyone. Maryanne will be honoured in a Celebration of Life on the 28 June 2014, 1853 Columbia Street, Coalmont BC (Behind the Hotel) starting at 2 PM. Maryanne made it quite clear that she wanted everyone to get together, listen to good music, eat and have a good time. The Regional District has been asking people what their connection to the region is and why this place is important to them. There were several public consultations already, but that was just the first round of public engagement. However if you didn’t hear about it (many didn’t) and still want to add your input, you can go to the RDOS web site and fill out the questionnaire on-line. The Strategic Plan will identify important themes in the history of the Okanagan – Similkameen and, through public consultation, identify the heritage values and historic places that are important to the community. Based on these values, the Plan will outline the vision, goals and direction for the conservation and development of the region’s heritage resources, for the benefit of all communities in the region. These are lofty goals indeed. 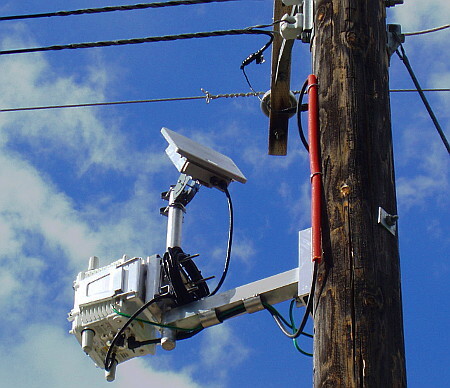 Whether the public input will offer sufficiently rich data to be really meaningful to this perspective remains to be seen. Most people seem to understand the value of physical history and historic sites, but are less clear on sociology as it pertains to history. My overall view is that it is way too deep and complex for the average person. There were parts of it I didn’t understand at all. Throughout the booklet there are orange sidebar blocks that ask specific questions. The reader is invited to give feedback on those questions to “help shape the forthcoming community consultation process, and help refine this Heritage Strategic Plan study”. An example of two of these sidebar blocks are: “Why is the theme of indigenous ingenuity so important to the heritage of Okanagan-Similkameen? What elements of this theme have not been addressed here?” and “what is the significance of regional governance to the heritage of Okanagan-Similkameen?” I found those questions too deep for my simple mind to wrap around. In fact, I felt like I was answering exam questions in school. 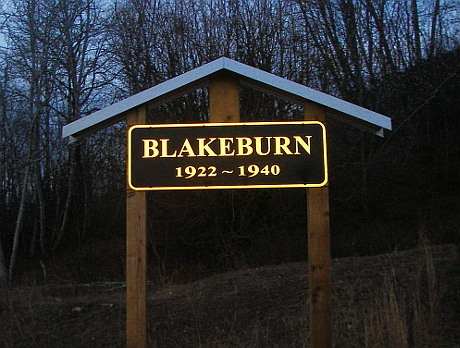 To mark and commemorate the lost town of Blakeburn, there is now a sign near where the company store and post office was once located. 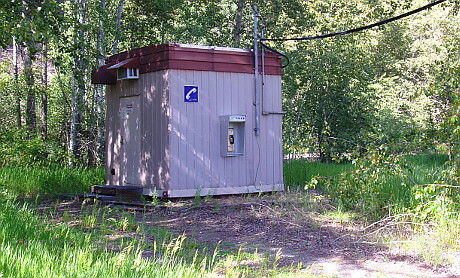 It’s been 73 years since the power was turned off in Blakeburn and everybody moved away. With the ravages of time there is almost nothing left on the site and it is completely overgrown. Some people thought that was a shame. 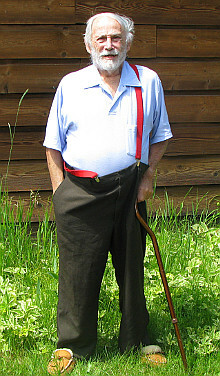 Bert Rice suggested at one of the Coalmont Community Association meetings that we should erect a sign. Everyone agreed, and the wheels were set in motion. It turned out to be a project involving a number of people. I designed the graphic. Sharon and James McCulloch got the actual sign made (see previous story) and paid for it out of their own money. Chris Goodfellow then bought lumber and built the structure. That’s when his father, Eric Goodfellow saw the project and was thrilled that the place where he used to go as a kid was finally being honoured. The Goodfellows go back a long way in this area. (See Goodfellow Creek.) Eric then offered to procure a metal cap to finish off the top of the sign. To further show his appreciation he also donated $100 to the Community Association. He then went to the Tin Man where Fred Robbins made the generous gesture of doing the work for free since he too thought it was a good cause. 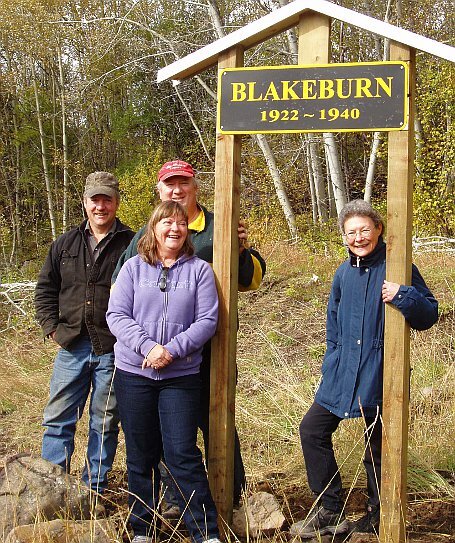 This morning a small party consisting of myself, Chris and Penny Goodfellow, and Eileen Walsh, went up Blakeburn Road, turned left onto Arrasta Creek Forest Service Road and stopped at the original site of the Blakeburn store and post office. Waiting for us there was Bert Rice with his mini excavator on its trailer. Bert is clearly an artist with that machine. It didn’t take long for him to clear a spot, dig the holes, and arrange some rocks to make the place look nice. 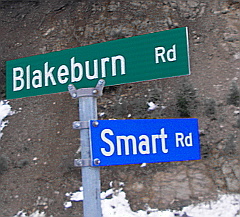 Now there is finally a marker for this unique little mining town of Blakeburn. People who travel up that way to explore or pay homage to the history will no longer come back saying they couldn’t find it. Left to right: Bert Rice, Chris and Penny Goodfellow, Eileen Walsh. Bert Rice Mini Excavator 250-295-6218 ~ Custom work available on short notice. 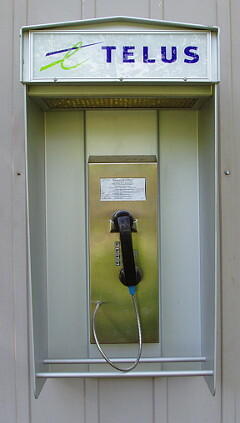 The Tin Man Metal Roofing 250-295-3743 ~ Metal roofing sales and installation.